CHARLOTTESVILLE, February 5, 2019. The Virginia Law Foundation and Lawyers Helping Lawyers hosted the First Annual Law Student Wellness Summit today at the University of Virginia School of Law. The challenges and health risks that lawyers face have been well-documented. These concerns are even more prevalent among law students. The Virginia Law Student Wellness Summit gathered together leaders of Virginia’s legal community to address these issues and discuss opportunities to promote law student well-being. “The First Annual Virginia Law Student Wellness Summit provided an unprecedented opportunity to shine a bright light on a problem that exists in plain sight – the alarmingly evident lack of wellness amongst our Virginia lawyers and law students,” said David S. Mercer of MercerTrigiani in Alexandria, who was on the summit’s planning committee. The inaugural summit featured several speakers, including Supreme Court of Virginia Chief Justice Donald W. Lemons, Justice William C. Mims, and other members of the Court. 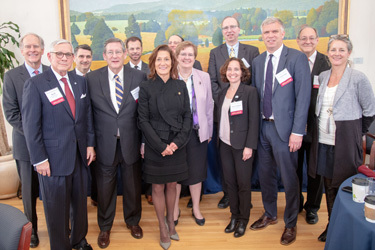 Also in attendance were the deans of seven Virginia law schools, members of the Virginia Board of Bar Examiners, and staff from the Virginia State Bar, The Virginia Bar Association, Lawyers Helping Lawyers, and The VBA Young Lawyers Division. These various perspectives provided insight into the key challenges to law student wellness, as well as possible ways to address these concerns.